Martha Edna Wright was born in Pierce City, Missouri. She attended public schools, and went on to graduate with a B.A. from the University of Missouri in 1934. She choose to continue her education by studying law and graduated from the University of Michigan Law School in 1940. She married Hicks George Griffiths (b. 1910), a lawyer and a judge as well as chairman of the Michigan Democratic Party from 1949–1950. She worked as a lawyer in private practice, then in the legal department of the American Automobile Insurance Co. in Detroit from 1941–1942 and then as the Ordnance District contract negotiator from 1942-1946. 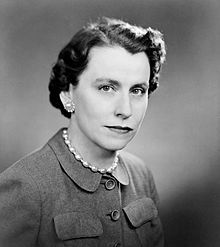 She was elected to the Michigan House of Representatives, serving from 1949 to 1953 for the Wayne County 1st district. In 1953, she was appointed as recorder and judge of the Recorder's Court in Detroit and sat as judge from 1953–1954--  the first woman to do so. In 1954, Griffiths was elected as a Democrat from Michigan's 17th congressional district to the 84th Congress and was subsequently re-elected to the nine following Congresses, serving from January 3, 1955 to December 31, 1974 in the U.S. House. She sat as a delegate at the Democratic National Convention in 1956 as well as in 1968. She was not a candidate for re-election to the 94th Congress in 1974. During her time in Congress, Griffiths sponsored the Equal Rights Amendment, one of 33 proposed amendments to pass in Congress and be sent to the states for ratification, and among the six that were not ratified. The weapons she deployed during her 10-term congressional career included implacable determination, a lawyer's grasp of procedural niceties, and a tongue like a blacksmith's rasp. "I don't know really that I have so much perseverance as I do a sense of indignity at the fact that women are not justly treated. I have the same sort of feeling for Blacks, Latinos and the Asiatics. If we are America, then we ought to be what we say we are. We ought to be the land of the free and the brave. What people sought in this land was justice." "Some of that I get from my father. I adored my father. My father thought that girls were smarter than boys, which was unusual in my day and age." After her congressional service, Griffiths returned to the practice of law and then served as the 59th Lieutenant Governor of Michigan from 1983 to 1991 on the ticket of Governor James Blanchard. She was inducted into the Michigan Women's Hall of Fame in 1983 and to the National Women's Hall of Fame a decade later in 1993. She retired to her home in Armada, Michigan, where she lived until her death in 2003 at age 91. Martha Griffiths was a member of the American Association of University Women. The AAUW of Michigan named its "Martha Griffiths Equity Award" in her honor. ^ "Martha Griffiths and the Equal Rights Amendment". National Archives: The Center for Legislative Archives. Retrieved 2013-05-20. ^ a b "GRIFFITHS, Martha Wright (1912-2003)". Biographical Directory of the United States Congress. Retrieved 2013-05-21. ^ a b "Martha Griffiths, Fighter for Women's Rights, Dies at 91". Common Dreams. 2003-04-25. Archived from the original on 2013-06-16. Retrieved 2013-05-21. ^ "Martha Griffiths Biography". Encyclopedia of World Biography. Retrieved 2013-05-21. ^ "Obituary: Martha Griffiths". The Guardian. London. 2003-04-28. Retrieved 2013-05-21. ^ Keenan, Marney Rich (1990-01-07). "Martha Griffiths". Chicago Tribune. Retrieved 2013-05-21. ^ "Awards". AAUW Michigan - American Association of University Women, Michigan. Archived from the original on 2013-08-19. Retrieved 2013-05-21. United States Congress. "Martha Griffiths (id: G000471)". Biographical Directory of the United States Congress. "Martha Griffiths (b. 1912) (RYA 1064-1073). Taped interview and transcript". Women in Congress:Recorded Sound Section--Motion Picture, Broadcasting and Recorded Sound Division, Library of Congress.